Official music video for "All About Soul." © 1993 Sony BMG Music Entertainment. Side Two of River of Dreams is more optimistic in tone than the sobering, almost pessimistic, reality of Side One. It begins with "All About Soul," another one of Billy's realistic or tough love songs along the lines of "A Matter of Trust" and "Honesty." "All About Soul" espouses the importance of devotion and strength in a relationship. Love is important (so is honesty and trust), but "under the love is a stronger emotion" and that emotion is loyalty and dedication to each other, and the ability to inspire your partner and make that person a better person. "She gives me all her tenderness, and takes away my pain." The song is soulful almost mournful with a slow steady beat. There is a slight gospel feel to the song too. Billy is backed by a small orchestra while the group Color Me Badd and the talented Crystal Taliefero provide background vocals. Originally, the working title of the song was "The Motorcycle Song" and Billy had filler lyrics about riding a motorcycle down the "Jericho Road," but then he slowed it down and turned it into "All About Soul." "The Motorcycle Song" can be heard on the collection My Lives. "All About Soul" reached number 29 on the U.S. Billboard charts. There is both a radio edit version of the song (on the CD single) as well as a re-mix (on My Lives and the CD single). The B side of the CD single is "You Picked A Real Bad Time" which is not on River of Dreams, but was one of the songs Billy first recorded for possible inclusion on the album. Billy on "All About Soul" from SiriusXM. Art for single cover of "All About Soul." By Christie Brinkley. Should drive her away, so why does she stay? 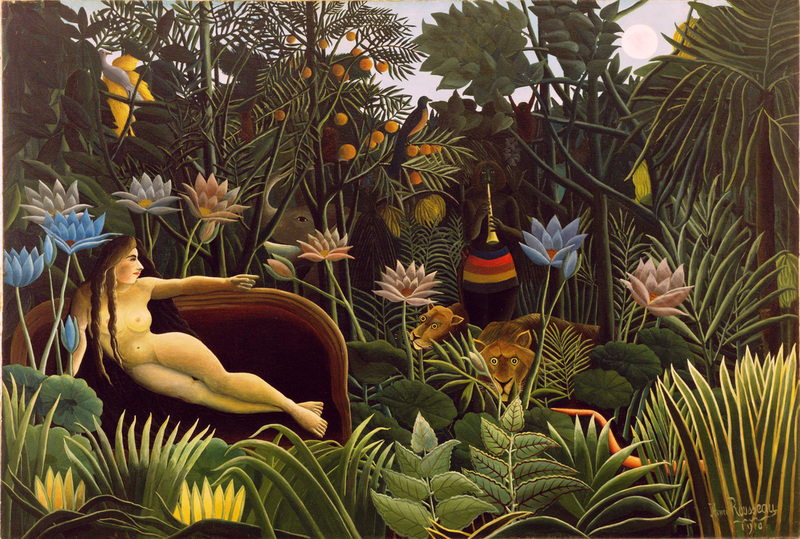 It reminds me of Henri Rousseau's "The Dream," which is appropriate for this album. I also love "The Sleeping Gypsy." Live version at the Boston Garden from 1993's "Shades of Grey" documentary. Live version (audio only) from Billy's appearance on Saturday Night Live in 1993. Billy on SNL in 1993.